Perhaps it's just an inherent downside to anything really good - that it will be overdone, spun, extended, commercialized, branded, marketed. We live in a time when the means to overdo are readily available - powerful tools, technologies and ways of distribution. And of course the tremendous money behind it all drives everything. 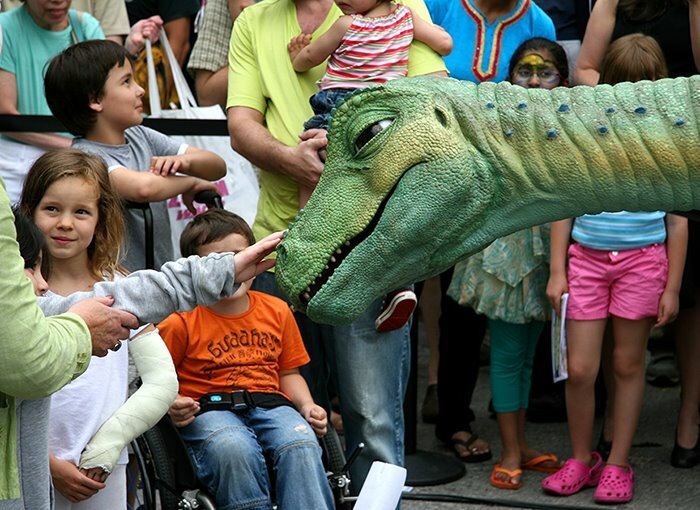 Over the weekend, NYC was host to the first World Science Festival. This was a combination free outdoor street festival and also a series of programs with renowned scientists including many nobel laureates. The programs were ticketed events held around the city in various venues. Many were sold out. The free outdoor festival, held in and around Washington Square Park, was oriented towards the entertainment and education of children. See here for more photos of the event. The central event was Lucky the Dinosaur - a free-roving audio-animatronic figure created by Disney's Imagineers over a period of five years and unveiled in 2005 (audio- animatotronics were invented by Disney and made their major debut in 1963 with a display of singing birds and flowers at The Enchanted Tiki Room at Disneyland Resort).